Ankara is the capital of Turkey and the second largest city in the country. Its central location makes it easy to access through a number of different forms of transport. This city has a lot to offer tourists including ancient ruins, museums and scenic areas. There are a number of luxury hotels in Ankara, Turkey that offer superb facilities and services; as well as self-contained serviced apartments in Ankara. However, for those trying to stick to a strict budget, there are also a number of cheap hotels in Ankara that will take care of all your basic needs. Built in 1944, the Ataturk Mausoleum (the mausoleum of Kemal Ataturk) is not just a stunning historical structure but it also has a stunning view overlooking the city. There are also some lovely museums to visit while in Ankara. 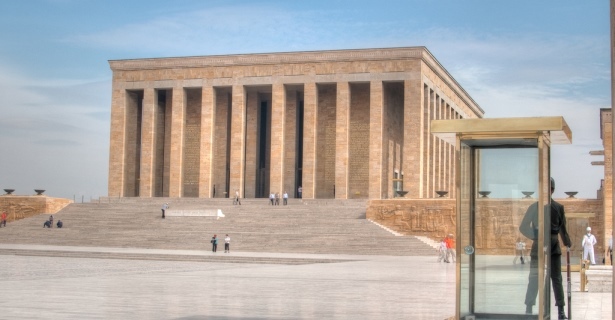 The Cengelhan Rahmi M. Koc Museum, Anatolian Civilizations Museum (Anadolu Medeniyetleri Muzesi) and the Museum of the War of Independence (Kurtulus Savasi Muzesi) are just three of the most popular among tourists. Take a walk through the Hamamonu Restored Area and enjoy the beautifully restored buildings from back in the 1920s and 1930s. These structures were once houses but have now been converted into shops, cafes and restaurants. The Kocatepe Mosque (Kocatepe Camii) is both the newest and the largest in the city. It was built between 1967 and 1987. Even if you do not step inside, the architectural beauty of the exterior is worth having a look at. A trip to Ankara Castle is another absolute must. Just looking at this fascinating structure will reveal the influences of various cultures. Take note of the different building styles, techniques and materials used. When it comes to ruins, the Temple of Augustus and Ankara Citadel (Hisar) are two local favourites. Just the sight of them is enough to delight any visitor. It’s interesting to note that both the Citadel and the temple have been influenced by Roman architecture. The foundations of the Citadel were laid by the Galatian’s but the structure itself was completed by the Romans. As for the Temple of Augustus, it was built in honour of the Emperor Augustus in 10 AD and was reconstructed by the Romans later on. Genclik Park is a wonderful place to visit with the whole family. It is located in the middle of the city and offers plenty of space for kids to play. There are also fountains, pools and cafes and restaurants should you wish to grab a refreshment. Anfa Altinpark is another lovely park for the whole family with plenty of things to do and see. The water features and greenery make for a perfect picnic spot and a fantastic getaway from the busy city. For theatre lovers, you are in luck! There are a number of theatres in the city for you to enjoy. The Kucuk Tiyatro and Akun Sahnesi are two of the most popular among locals and tourists. An online search to find where to stay in Ankara is the easiest way to browse through all the accommodation in Ankara Turkey and make an informed decision. Thanks to the detailed descriptions, photographs and guest reviews, finding the best hotel in Ankara, Turkey and making an online booking could never be easier! Remember to look out for promotions, discounts and other special offers.